ProtoMon is a server monitoring software intended to continuously check your servers and computers at specified intervals and immediately notify you about any problems. file server monitoring (FTP/FTPS/SFTP, content checking). remote computers monitoring (CPU load, memory, disks, files, processes, services, registry, etc.). visual, sound, and e-mail notifications on failures. full statistics for future review. 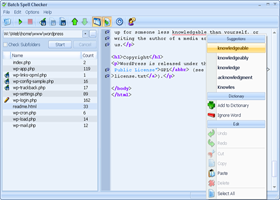 BatchSpellChecker is a professional code-aware batch spell checker software for the programmers, web developers, proofreaders and other people who need to deal with a large number of source code files and documents. batch search for files with misprints in the specified folder and subfolders. quick navigation between the files and misprints. ignorance of the markup elements. 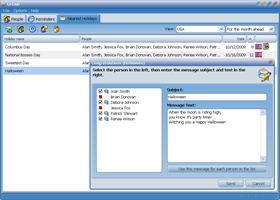 GrizeR is a powerful and easy-to-use holiday and birthday reminder software with a built-in e-mail client to send the letters of congratulation. manage the list of your family and friends. select the holidays you wish to congratulate them with (from the updateable list which contains the holidays of the different countries). get the visual and sound notifications. send the letters of congratulation directly from the program. create any number of custom, one-time or recurrent reminders you need. 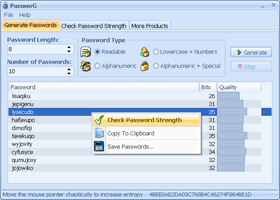 PassworG is a portable and free password generator software with a built-in password quality checker. generates the passwords of any length. generates the passwords of the different kinds (readable, lowercase chars + numbers, alphanumeric, alphanumeric + special chars, etc.). saves the generated passwords to a file. checks your passwords strength and shows suggestions on how to increase their quality. no installation is needed, works from the USB drive or any other removable media. 1. Multithreading. Many other ping test tools are using a single thread to ping a host. It means that the second request will be sent only when the first one was replied or timed out. Should you wish to ping some "malfunctioning" server with a greater timeout, you will immediately receive a less detailed picture of what is happening. GoPing will use as many threads as needed to ping a single server strictly with a specified interval. 2. High frequency. 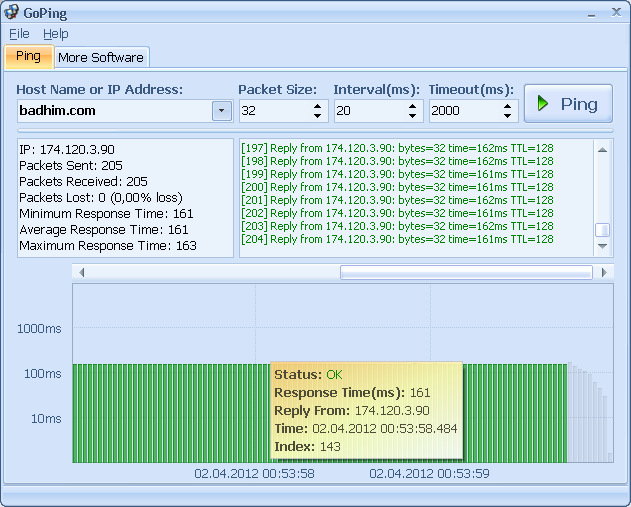 Most utilities allow you to specify a minimum ping interval of 1 second or more. Several of them supports a 100 millisecond interval. With GoPing you can send the ping requests every 20 milliseconds. In view of the first paragraph, this gives you really smooth and precise ping statistics. 3. Graphical representation of data. This ping tool renders an informative multicolor chart with verbose and descriptive hints. The X axis is in linear scale and has a scrollbar that allows you to handle any amount of data. The Y axis is in logarithmic scale that gives your charts a unified view. All graphs have the same scale that makes them easy to compare. 4. Data transfer. The gathered data can be saved to a binary file and opened anytime later on any other computer with GoPing. This will be useful if you wish to show the ping test results to your network administrator, ISP or hosting provider, to prove that you have some problems with your connection.